← What does God see when he looks at us? The word touchstone has several meanings. In times past, a touchstone was a dark stone, such as basalt or jasper that was used to test the quality of gold or silver. From that came the more common meaning, that of a reference point from which to evaluate the quality or excellence of something. A touchstone can be a personal symbol or emblem that represents your dream and that helps you to stay on track and stay true to your vision. Throughout the centuries, indigenous people on every continent have used ‘medicine bags’ in a similar way. In 1991, hikers found the body of Otzi the Iceman, a man who had frozen to death high in the Italian Alps over 5,000 years ago. He was almost perfectly preserved and, based on his tattoos, clothing and medicine bag, one of the theories is that he was a shaman who had been on a vision quest or carrying out some mystical or ceremonial ritual when he was overtaken by bad weather. His medicine bag carried objects very similar to those that would be carried by a modern day Native American. The term ‘medicine’ in this context refers to anything related to the spirit world, Medicine bags provide guidance, healing and protection for their owners. The bags or pouches can be leather, are often decorated with beads, and contain items such as quartz crystals, feathers, plants, or shells. The items in a medicine bag represent the wearer and are often gathered as part of a vision quest. Your own touchstone or ‘medicine’ should be something meaningful to you, something that has special significance or resonates with you. I’m sure you’ve had the experience of finding a small item, perhaps a rock, leaf, flower or shell that seemed to be just waiting for you to pick it up and carry it home. Then when you get it there you have no idea what to do with it. Such a finding might become your touchstone. 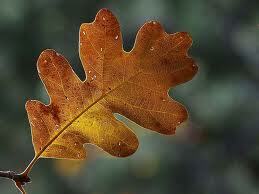 Oak leaves have always had special significance for me. The feng shui practitioners program I took was held in the middle of a beautiful oak forest in Indiana. It was fall of 2001 and as I strolled through the woods in the early morning or evening, oak leaves would be gently falling all around me. During one session on nature spirits we were sent out to ‘talk to the nature sprites’. That was while I was still a part of a very strict fundamentalist religion and I was very uncomfortable with the possibility of connecting with demons. Not only that, I just felt plain stupid, talking to sprites – really! But I went out to look for a sprite anyway, even though I had no idea how to recognize one. Were they like leprechauns? Not seeing any little people, I strolled up to a majestic oak tree and tried to start a conversation. Now I am shamed by that cavalier attitude, but at the time I really wasn’t taking it seriously. In fact, if truth be told, I was making fun of the whole woodland sprites thing. I noticed a nice clump of leaves hanging on the other side of the tree and I headed over only to get attacked by a thorn bush and quite tangled up. When I wrestled myself free, already thinking, “Oh oh, I’m being punished”, I gave up and headed down to the pond to lie on the hammock. A week later, as the program came to an end, we all said goodbye and gave each other final messages and hugs. One person gave me a beautiful oak leaf which I wrapped carefully in my luggage and still keep today hanging from a ribbon. An oak leaf has become one of my touchstones, reminding me to be grateful for what I have and not to disregard the beauty in every day life while I wait for my future to show up. When choosing your own touchstone make it meaningful to you. Select something that will inspire you and reorient you to your dream every time you touch it or see it. It could relate to one of the goals you’ve already achieved, a reminder of what you have already accomplished and that you have the strength and the commitment to reach your goals. For example, years ago, I used to ask people in workshops to describe what success meant to them. The example I gave was that always having fresh flowers in my house would be my sign of success. Fresh flowers could become my touchstone. I could buy flowers every week, and then as I arrange them and place them just so on my coffee table, I would be reminded that I’m already a success. I would be encouraged to stay on track and achieve even more. Your touchstone might be a picture or a drawing that you create just for this purpose. I have such a drawing. It’s like my own personal logo. It’s a line drawing that looks vaguely like a person reaching up toward the sky with one hand, and down toward the ground with the other. I pulled it from the Major Arcana tarot card, The Magician, and it represents pulling down the power of the Universe and turning it into reality here on earth. If it was my touchstone I could draw it and put it on books, my journal, on my monitor, or even on my door so that I would be constantly reminded to stay true to my dream. Your touchstone might be small object. In the movie, The Secret, there was a story about someone who used a small rock as a touchstone. As a kayaker, I used to love to walk along isolated beaches, picking up beautiful rocks. Actually, a love of rocks must be very common because all of us in the group would have kayaks much lower in the water on the return trip due to all the rocks in the bottom. For years I had those rocks in a bowl in my house. Now I have them all around the fireplace in my backyard including a large one engraved with the word ‘Friends’. If you are a religious person, you may have a medal or sacramental object that would act as a touchstone for you. A particular word might be particularly meaningful for you. If so, you could use that word as a touchstone, writing it in your calendar or journal, using it as a screensaver, or using it as a mantra to help you meditate. You can use your touchstone as a reminder as you try to control your thinking or change behaviour. For example, let’s say you are trying to eliminate negative thinking, perhaps by trying the Seven Day Mental Diet that was developed back in the 30s by Emmet Fox. Wear a stretchy or easily removable bracelet and every time you have a negative thought, change it over to your other wrist. It’s a way of becoming aware of your thoughts and taking action to get back on track. Your touchstone is uniquely yours to choose. Use it to as a way of keeping your vision front and centre as you move steadily towards your future. Draw your own symbol or choose a word, picture or object to be your touchstone. What does your touchstone mean to you? Where can you put your touchstone so that it acts as a constant reminder of your unique vision of the life you want to create? How can you use it most effectively? This entry was posted in great memories, personal power, touchstones and tagged ultimate blog challenge. Bookmark the permalink. I really enjoy your posts and find myself seeking them out every day. I think we are kindred spirits when you write, I resonate, thank you for a lovely post. My touchstone is a pink angel and she reminds me who I am. I love leaves, I always have collected them and sometimes I still find some in very old scoolbooks, where i have put them to dry. Also my artwork is mostly about nature and the small treasures. thanks for your lovely post. I do the same thing. I have lots of dried leaves. I sometimes frame them and write a meaningful quotation around them to give as gifts. Thank you SO much for this post. I have really been doing a great deal of inner work, moving and clearing out a lot of old energies – and this post about having a ‘touchstone’ plays right into that. I just have NO idea what I would use! Also thank you for mentioning the Emmet Fox book. I’ve never read it and actually now would be a great time to dive into a mental diet! Gratitude for the excellent posts. I haven’t commented every day but THANK YOU. Hi Della. Take the time to just consider your touchstone. I bet once you put some attention to it it will just jump out and say ‘pick me!’ By the way, I wrote an updated version of the Seven Day Mental Diet that is available on Amazon.com. I interviewed people who were able to successfully complete the Seven Day Mental Diet and came up with 7 guiding principles to help someone rid themselves of negativity. It’s just a little book but I think out of the ones I wrote, it’s my favorite.